Over 125,000 people just like you love to learn social media with SMMU. Would you like to share your experience with us? Click here to submit your SMMU training review. @JohnPaulSouza thanks! I enjoy the short video segments. Its great for mental breaks and easy to track my progress. The certification program helped me in understanding the basics of each social media tool. I also enjoyed the discussions. Thank you--wonderful information that has been shared. Simply terrific! Just attended an excellent webinar from Social Media Marketing on the power of social media and how to use it properly. Great stuff. Every course was designed and instructed with top-notch information, making it an exciting experience within each module! I am so thankful for the opportunity to be SMMU Certified and looking forward to the opportunities that being a 'Specialist' consists of. @SMMagic Thanks for the great webinar. So much to think about and implement, where to begin? SMMU, thanks for getting the wheels rolling. Just finished grat 90 minute webinar with SMMU. Learned lots. Very useful! I was relatively new to SM prior to the course. The most valuable part of the course for me was the hands-on demonstration that accompanied each webinar. The expertise of each instructor was phenomenal and their teaching skills were perfect. I also enjoyed the expert's book recommendations and case-study/client examples and results. Overall, I loved the course and highly recommend it for any business person. Enjoyed the session today and the whole series. Excited to hammer out a social media strategy and to get things going! Just completed my Mobile Marketing certification from @SMMagic! One more tool of awesomeness for my marketing tool belt. Great course guys! Just finished the SMMU exam! I'm now official a certified Social Media Strategist! Great info today from SMMU about managing time more effectively for social media. Just finished the SMMU webinar. Lots of interesting tips and advice. Some changes to follow methinks. I just read your Social Media Guide. Very helpful! Frankly I thought the course is invaluable and I would like to help inform more people about it! @SMMagic You guys produce great work! Look forward to many more shares in the future. John Souza is the founder of SMMU and the 2011 Tech Marketing Awards 'Social Media Marketer of the Year. Get it right with social media marketing to forge partnerships and bring leads to create business revenue. Social media doesn't work! Unless you do it right. ... Wow that was a great vid SMMU. Best 40min spent! Attended SMMU Session today! SMMU great way to enhance social media skills! "Align your business interests with your personal philosophy." Thank you @Ekaterina and #SMMU for the excellent presentation today! This program is easy to understand and follow. You can do it at your own pace and get the most out of all that is available to you. The only problem you will have is choosing the 2 electives you want after your 6 core courses. There are so many great choices for electives! I attended a free Webinar on Social Media Marketing for Business by Social Media Magic - Good stuff! Your instruction and help sounds like what needs to be done to get yourself ready to convert leads. What you are offering sounds like it would be a LOT more effective! I like SMMU's sessions on video. Simple & Easy to do! Thanks! Exceptional session today. Extremely informative & improved my understanding of social media & how to effectively use it. Good overviews of all social media platforms! The session on LinkedIn was the most relevant. It seems to be the least intuitive resource and having such clear steps and purposes defined will help not only me but my clients as well. Yesterdays SMMU session about Twitter was great! Learned so much. In 4 weeks SMMU training helped me be on page 1 of LinkedIn Recruiting markets. I picked up 2 new clients! I am now a Certified Social Media Marketer, Thanks SMMU! I just passed my SMMU certification test. 92 out of 100! I'm now a certified Social Media Specialist. Yay!! Listening to @Richard_Weiler's tutorial abut #SEO via @SMMagic - So much to learn! Awesome webinar! "Think Like Zuck" by #SMMU. Thanks guys-super inspiring! Wow - that was a ton of info. Thanks so much SMMU! Hi, John, I am taking courses at Social Media Marketing University and I'd like to thank you for creating such a good opportunity for people to learn about social media marketing. Thanks for the retweet and nonstop great information! My key to becoming a social media genius, following your great tweets! Great insights and direction - immediately usable. Thanks SMMU! Great info from SMMU on Twitter for Social Media for business. I got a lot out of SMMU. It's good to learn how to use it to market my business. Attended SMMU's "Capitalizing on the Conversation" webinar - great overview of social media best practices! Thank you very much for the Seminar. Cheers. Just attended SMMU social media session -GREAT content! Thrilled - have passed my certified Social Media Strategist test. Looking forward to advanced studies! Doing work! Lovin' this SMMU certification! You think you know but you just don't know! Just listening to a SMMU webinar, really informative stuff - and its free. Watch out tweeters- I am learning!! I found the Q&A session to be most informative as it tied what we learned with the session to practical experience. All of the session leaders were extremely enthusiastic and knowledgeable in their area of expertise! Thank you! Wishing I could TIVO this SMMU session. Lots of info! This course is excellent. I had no idea social marketing held so much promise. Can't wait to start seeing results! I am so excited about SMMU and can appreciate what they have done! Its above and beyond what I could have ever thought possible. I Attended a SMMU social media workshop late last night. It was informative. Recommend it. Good video training today with #SMMU Social Media Marketing University. @smmagic @lasseweb20 Start using video to promote things now! This is fantastic great insight!! thanks Gentlemen. Time is a huge concern for me so the class about Niche Sites and Time Management was very useful. John, I have my Social Media Certification from SMMU. I appreciate your courses and how you keep us updated on the latest social media trends. Thanks! The sessions helped me to understand the strategies associated with Linkedin, Facebook, and Twitter. Glad I attended SMMU for the social media coursework. Hoping it will accelerate my job search with the new skills! Attending a Social Media Magic University webinar... great tools to update you status in multiple social networks! Thanks SMMU for seminar today! We are a traditional PR company but exploding in Social Media. The emphasis on how all of social media works together and the need for a strategy was really defined in the program. Is it possible to have fun learning? Absolutely and it is happening now! Thank you SMMU! Great content today from SMMU regarding Social Media Strategy! Very useful for monitoring the conversation & starting staff on a blogging journey. The entire program opened a whole new world for me. Thank you so much. The SMMU webinar was fantastic. These guys know their stuff!!! Thanks again for the inspiration. SMMU, You rock! Great information on SMMU Webinar this morning! I just passed my exam with a 95%. Thanks for the education SMMU! This is an Awesome webinar for my online buisness!!! #SMMU great webinar about 7 rules to ROCK your Social Media Marketing in 2014! Thanks to Ty & Lee for sharing their wisdom with us! Great class on advance usage of Twitter. Very much enjoyed the basic social media facts with today's #SMMU Social Media Marketing. Your 7 rules rock! I loved the step-by-step walk through of each social media platform. Thanks #SMMU @SMMagic for an amazingly informative and useful webinar this mroning on #7 Rules to Rock Your #Social #Marketing"
The SMMU training is strategic in scope and thinking, yet still gets down to the nitty-gritty details I need. Freelance Writer/Social Media Marketer / Mention It! Great Social Media Training today with #SMMU Social Media Marketing University. @SMMagic Thanks! Some good points raised in your SMMU session. Thanks! Loved today's "7 Rules to Rock Your Social Marketing this Year" webinar presentation. It was the best of its kind I have seen. Can't wait to join Social Media Inner Circle. We used SMMU and we have benefited greatly. One of our employees was sent through the courses and has been able to have a much better understanding of Social Media and whats involved. Thank you SMMU! All of the sessions were very imformative but I feel that I got the most from the Facebook, LinkedIn and Twitter sessions. Reviewing classes and getting ready for test...awesome material! SMMU session on Twitter. Excellent! Thank you, Great tips and tools. The course helped me understand the vast array of tools and channels to identify prospects, engage in conversations, manage my time, and measure my progress with social media marketing campaigns. From the course I was able to bring all the social media tools together for a united effort and the knowledge of tools previously not known to me. Thanks SMMU 4 a great FB for Biz. It was helpful. Thanks for the social media webinar guys! It was great and I learned some interesting new things. GREAT EDUCATION on the unknown secrets of social media marketing! Helpful social media webinar by #smmu Thanks for the overview! Re-listening to SMMU, very interesting theories on engagement and building partnerships in social media. Writer, blogger & Internet enthusiast / Get Creative Inc. Learn Social Media the right way, Attend the 90 Minute Webinar at SMMU! Doing a linkedin 101 webinar for SMMU - love this stuff! John, Great Webinar yesterday - great tips and ideas generated - so, signed up for the training. Great session on using videos and cross-promoting. Great focus on using Social Media to build brand to attract clients. Thanks for the newsletter that you provide about social media magic. Love it. Thank you! @SMMagic Thanks for a great webinar this morning! SO incredibly helpful! Very motivated by #SMMU @jeffbullas presentation this afternoon. Thanks! Now I'm going to "just start." President / Smart Solutions Group, Inc. Loved the session today - looking forward to using the tools and niche sites to make life easier. I was amazed at what I didn't know before I entered the program! SMMU provided an incredible overview as well as specific tips and tricks of all the social media sites. I feel like I have a very good understanding of how it all works now and have seen my business begin to track upward since beginning the course. The entire package was incredible! I loved the basic sessions followed by the advanced. I also loved it being so compressed. Your speakers were very prepared and gave real examples, tips and tricks. Marketing Director / gotoBilling, Inc.
Great recommendations on how to find your audience and engage. Just had an excellent webinar with SMMU. WOW - lots of expertise and knowledge shared. Thanks!! Thanks for the webinar on LinkedIn today - both very interesting and actionable. One of the better social media conversations I've been a part of. The Q&A was great too. This program really hit the key elements of Social Media as it stands in the marketplace right now. It is an exciting field that is constantly changing but this program really hit the core. I like the flexibility as we are all very busy. 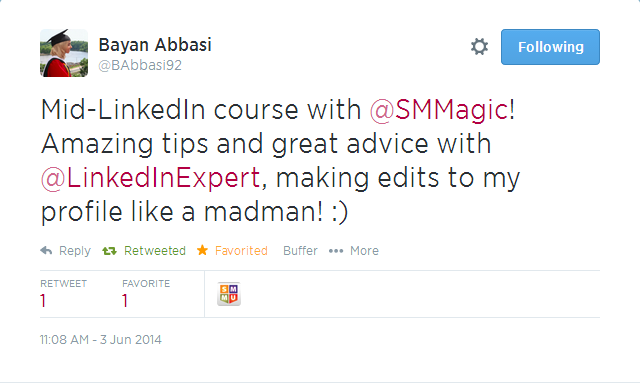 I earned an Advanced #LinkedIn Certificate through @SMMagic. Course taught by @LinkedInExpert. I highly recommend it! Woohoo! Passed my Social Media Marketer certification exam at SMMU. Thanks for the Certification! Instructional Designer / WIT Learning Solution Inc. While the rest of America is watching the #SuperBowl, I'm listening to @LinkedInExpert's genius #LinkedIn lessons. I'm blown away! Good discussion during a webinar from SMMU! It is hard to pick one session over the others; I feel that every session was filled with useful information that I was able to put into practice immediately. From Twitter to Facebook to LinkedIn to blogging, all of it helped me immensely. I haven't gotten a YouTube site up, yet, but understand the value of that in my overall social media portfolio. 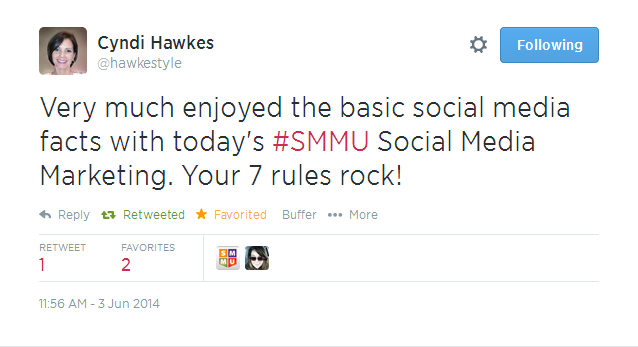 Tons of great information on today's webinar from #SMMU on 7 Rules to Rock Your Social Media Marketing. I just want to thank you to John Souza because my social media experience has blown up (in a good way) since he taught my class! He is a great tutor! The fact that SMMU was a one stop shop to bring business professionals up to speed on the emerging world of social media was extremely beneficial. SMMU is a great presenter on social media. Lots of content. 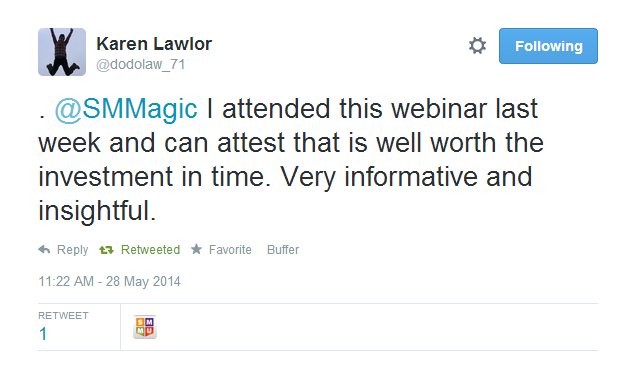 Just finished participating in a fantastic webinar on social media with the guys at Social Media Magic! Just attended a SMMU webinar for the last 90 mins. Lots of good info, I recommend spending the time! Listening to SMMU Webinar about Social Media. Good info being provided. My recent SMMU session amazed me! Training I received in Twitter, LinkedIn, and Facebook was phenomenal! The notes that can be downloaded and reviewed for later are very helpful. I am even able to follow along with the webinars and fill in any questions and post additional notes regarding Social Media. Product Specialist / Jorlink USA Inc.
Great information that I would like to share with my executives! Thanks! I enjoyed the tips related to Twitter and Facebook as well as business applications for YouTube and other video applications that were presented throughout the program. This presentation was extremely helpful for me. I have a client who's looking to secure an agency to do just this. Attended the SMMU Webinar today to learned more about driving positive revenue through Social Media Sites. Great experience. I have just signed a contract with a large real estate company for whom I will create the social media strategy. Huge thanks to SMMU for making this possible through my studies! Attended great first session. Good advice about how to create business relationships with partners. Thank you! Just passed the exam on SMMU! Looking forward to using what I have learned. Thanks so much! I have enjoyed and learned a lot of valuable info from SMMU. I like the tips and live views of each Social Media tool the best. Great tips for brand building using videos on the web. Thanks a lot! The SMMU session on Linkedin is so jam-packed with great info. Thanks! Just finished the 10 session Social Media Magic course. Great program. Congratulations on your impressive achievements helping the world understand the magic of social media! Information about blogging for your business was the most valuable for my particular company. Attending SMMU webcast on lead generation - finally a usable and monitizable approach! John's services for SMMU & his methodology are extremely focused and honed toward each specific client. I highly recommend him as a top professional. Taking SMMU Training is so informative and fun! Thank you for sharing your knowledge and making it so easy too understand and work with all the different media programs out there! I am learning about Social Media marketing through Social Media Marketing Univ. trying out tools now! Doing my first webinar ever: Capitalizing on the Conversation: Free Webinar presented by Social Media Magic. Exciting! The LinkedIn training with Jason Alba was great! ...Great webinars through Social Media University. Thank you! The Social Media Marketing University packed a great deal of information into the ten sessions. I was truly clueless on Social Media which is why I initially signed up, and I am thrilled that I now have a much better understanding of how we can use Social Media in building relationships and expanding the visibility of what we do. I appreciate all the transcripts which I will continue referring to as we build our business. I particularly find Jason Alba's strategy and LinkedIn discussions critically important to us, and am glad for the exposure to the other medias that we will no doubt be using. Currently in a SMMU Webinar, pretty interesting stuff. Some very useful notes and tips. Informative Social Media Time Management webinar highlighting successful tools & techniques! Great presentation @jeffbullas at SMMU today! Thanks for sharing all the valuable content tips. Just wanted to say thank you for this webinar, it was very informative. Thank you SMMU for the session today, great information given! Excellent job on the SMMU training course on twitter today. Thanks for the help!! Very informative webinar today on the power of video and YouTube. Thank you! Great Webinar on Social Media Marketing Best Practices from SMMU. Step by step on how your business should use social media. Im a 2011 SMMU graduate. Best thing I did for my Career. I am now MarCom Manager for NEBC and loving it! Enjoying the SMMU Facebook webinar...awesome! I've learned so much from the work you do at SMMU. Thank you! Engagement Strategist / Socialicia, LLC. I am a marketing major at a large university in Florida. Before my social media marketing training courses with SMMU, I didn't know very much about social media and my university does not have a social media class... most of my knowledge about social media came from the courses I took at SMMU. The program helped me by providing a road map and a guide to the various elements of social media and how to use each. Just attended the Social Media Marketing University webinar. Great info! Thanks SMMU.com for the intro class. Attended the SMMU webinar this morning. Good stuff in there for beginners to use Social Media for business. Thank you for the great insight as far as the value of approaching audiences as a person vs. a company. Very informative - thanks for the insight and keep in touch. Taking SMMU classes online. Great for PR experts.Thanks! Gotta say it old timey rap style: SMMU is da bomb. Today's info was excellent. Great session on Twitter today. Very practical and I can't wait to do more tweets. I am reviewing #SMMU Twitter 101. Enjoying your presentation a 2nd time! @SMMagic I attended this webinar last week and can attest that is well worth the investment in time. very informative and insightful. Made another great decision! Signed up for courses at SMMU. Looking forward to my certification! Excellent Twitter training session. The hour flew by! I am now a certified Social Media Strategist! Completed SMMU studies and completed examination. Great session by on SMMU on time management and the use of valuable tools to streamline the process! The video aspects that are now being incorporated into social media platforms were the most new to me. I learned a lot in SMMU, mainly Cross Connecting and SEO strategies! John Souza did an exceptional job on the recent project. He was fantastic to work with and provides Customer-service oriented Social Media Solutions. just attended the SMMU webinar. Great info! Thanks SMMU.com for the intro class. I am proud to say that I am a student of yours and it is so exciting and I am eager to learn, learn, learn, and of course, to graduate. Thank you! This webinar is very informative, thank you very much! Just took a very informative webinar with SMMU! Excellent course! I picked up some really helpful tips for Twitter, Facebook & YouTube! I’ve passed the final and graduated from SMMU with a certificate as a Social Media Strategist. Looking forward to expanding out to new customers and helping them find their way through Social Media and Marketing! Participated in a Great Session SMMU. Looking forward to the transcripts . I really loved the information that was given about Twitter and Linkedin in the certification program. Loved SMMU and all the great instructors. I would recommend anyone who want to know about social media should do it! This #Webinar was SO beneficial!! Thank you #SMMU I can't wait to sign up for classes! Thanks for connecting. I'm really enjoying the Social Media Marketing courses at SMMU. Great program! I'm looking for ways to become more valuable to my employer. I learned enough to do a strong social media plan for the organization. Thanks SMMU! I enjoyed all of the training I received from SMMU! Just finished a webinar on socialmedia via SMMU. Got some good ideas! #SMMU good job! Appreciate the Thought Leadership Thursday webinar! I got the most out of the excellent strategy discussions. Just finished a great Social Media Marketing Webinar from SMMU. Great session on social media today from SMMU! Thanks!! You provide an extraordinary service! Thanks a lot! Passed my SMMU Certification. Great Program:Social Media Marketing University!! @Jeff_Schneider learning mounds of goodness @SMMagic Twitter course u facilitate. Learn Social Media the right way, Attend the Social Media Magic 90 Minute Webinar! The overview, specifically the strategy session on how to plan for using Social Media was great. The presenter for Twitter and You Tube were very, very good! Great webinar today for Thought Leadership Thursday! I'm so excited! I just completed the course and got my certificate! Woot Woot!. I feel like a whole new world is opening up. Thanks! Thanks John Souza. Great session!! I aced my final exam from SMMU. I am officially a certified social media strategist!! If you have an interest in raising your social media skills - check out SMMU - Their Webinars and courses are excellent! Just enjoyed a great webinar with SMMU! I learned a lot attending the SMMU classes! I found the course in total to be helpful. The units were integrated very well, and helped to further demonstrate the value in delivering a cohesive message. Thank you VERY MUCH for offering such a valuable webinar and sponsoring John Alba's presentation! I'll be implementing his suggestions immediately. I found the 10 keys webinar today informative and professional. Im considering future training with SMMU. Thank You. Thanks for a great class today on SMMU! SMMU provided very valuable insights & actionable info for increasing your social media ROI. Thanks for the info! Picking up some advanced Twitter tricks with SMMU! Thanks! We’d love to hear your review! Click to share your story. Universities, Fortune 500 companies, ad agencies, accountants, PR Firms, non-profits, marketers, lawyers, government agencies, small businesses have all taken advantage of our world-class, award-winning social media training and certification.